An incredible combination between a malt rising from the Scottish mist and the Carribean sun spirit. The classic, renowned Mac Na Mara blend has been double matured and this limited edition has been finished in rum casks. This additional ageing provides its sweet and soft taste. The final product is a quite appealing marriage between a malt rising from the Scottish mist and a Carribean sun spirit. Light and sweet, it possesses the smoothness of rum. This un-chill filtered whisky has everything to seduce and surprise those on the look-out for malted novelties. 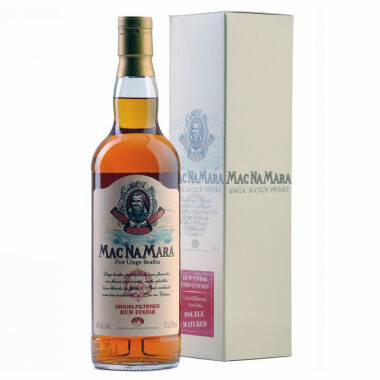 Gaelic whisky Mac Na Mara is known for its legendary regional character, such as "Te Bheag" and "Poit Dhubh". Mac Na Mara has been created by a gentleman-farmer, Sir Ian Noble of the Isle of Skye, off the West Coast of Scotland. Sir Ian Noble, aristocrat and advocate of the Celtic culture of his country, is deeply attached to the old traditions of the Gaelic communities. He created Mac Na Mara specifically for his fellow countrymen. As such, Mac Na Mara is a name known not only on the Isle of Skye, but also on other Gaelic-speaking countries and further, as in Nova Scotia. Sir Ian Noble, so as to maintain the authenticity and heritage of his whisky always refused to distil and sell his whisky to South English-speakers.